OK, they are DEFINITELY still up. But I did take down the Christmas decor a couple of months ago...the boxes may still be in the kitchen, but the tree is down. I promise. I love snowmen (but I hate real snow, go figure) and like to keep my snowmen decorations up until the weather turns warmer. After my recent trip to Blissdom, I was inspired by the bag of Hershey's Bliss Eggs that I received and decided to create my own Easter decor. While it was cute, I decided chocolate is to be EATEN, not just viewed. So I decided to use jelly beans instead...I just can't get into jelly beans, maybe it's because they are not chocolate. I don't think I'm going to win any awards for my crafty design but I think they are cute. I am planning to add some other fun spring decor but, of course, I need to clear the rest of the winter stuff off the side of the china cabinet that is just out of the shot above! 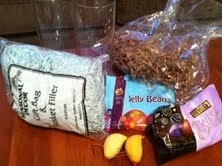 Disclaimer: Thanks to Hershey's for the yummy Easter candy. The opinions about their chocolate is, of course, my own as always.